Posted on June 30, 2009 at 9:57 pm in Hindi movies, Subtitle delight	| RSS feed You can skip to the end and leave a reply. The hindi dialogue would have been something like “Baal pak gayeh hain phir bhi tum buddo ho” – you have grown old, yet you are not so wise – i think that is the intention of the dialogue writer. The sub title is hilarious indeed! lol!!! I think sometimes we miss stuff not knowing the language, but in the same breath sometimes the translations are to die for! What a great one! What?! 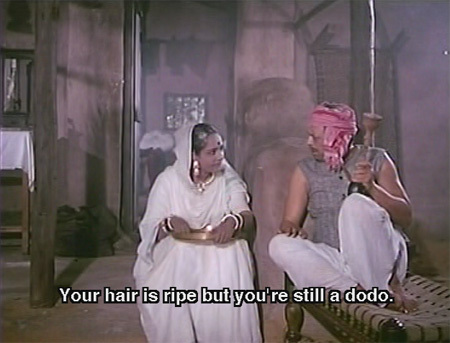 I can figure out the “Your hair is ripe” business – a literal translation of “baal pak gaye hain”, but what on earth does a dodo have to do with a woman who’s old? She should be extinct by now? Wait; maybe I think I know. When we were in college, and even among friends from office, a `dodo’ was somebody who was really dumb. Maybe that’s what he means. But definitely not a word one would use in subtitles, where people unfamiliar with Hinglish slang would be all at sea. You’re priceless, Greta for ferreting out these gems :-D Dustedoff is bang on regarding ‘dodo’. Reminds me of some amazingly absurd subs they used to have on Hong Kong movies. ‘Your hair has turned gray but you havent wisened, you are still stupid’. Reminds me of another subtitle in one of the screen-caps on this site… Something about ‘ Your worried hair’….. this must be a translation of the very poetic ‘ tumhari zulf pareeshan’….. which you might say to your flustered lover teasingly, it has to do with the curls in your hair and confusion….. But the literal translation makes it so absurd and YES Funny. So smelling ripe is fine! Thankgoodness. I should just worry about my hair then. From which movie is this. BTW I love Dulari! These subtitles are great precisely because it’s obvious what the intent is (at least it was for me: you are old but haven’t gotten any smarter—we use “dodo” to mean dumb as well) but the literal translation just doesn’t *quite* cut it. In fact, the subtitle went by and after a minute or so I thought: “Wait, what? Did I really just see that?” and went back to see it again. Priceless. And yes, Dulari is saying it to her husband, played by Nasir. Well, I’ve decided to write about it anyway for a few reasons…do be sure to give me your opinion on it as well! Boy Nasir was probably the greatest Bollywood actor when it came to playing ‘stressed out whiner’. Second only to AK Hangal. He is good at the hen-pecked husband thing! But it happens. Take “Hairaan”. A beaut of a movie in Telugu, abysmally dubbed in Hindi, and yet a sub-titled version is pretty much OK. (Watch it, if only for Sribaby and the songs). ROTFL :-)) That would have been the ultimate!